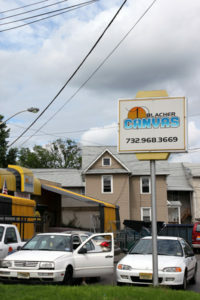 Blacher Canvas Products has been a family owned and operated business since 1947. We pride ourselves in detail so that all of our clients are 100% satisfied. We are in-house canvas awning manufacturers which is becoming less and less common. We pride ourselves in the more personable relationships we build with our clients. All of our awnings are custom made to fit your specific needs and we offer competitive pricing to fit every budget. Blacher Canvas Products is your one stop shop for canvas, vinyl, and mesh needs. We take care of each step of the job process including planning, fabrication, and installation. And essentially anything that can be sewn! Estimates on a particular job? Overview on a product we offer? Advice on deciding what will meet your needs? We’re open Monday – Friday, 8:00 AM – 4:30 PM, and Saturday 8:00 AM – 12:00 PM at 604 Bound Brook Road Dunellen, NJ. Visit or give us a call at 732-968-3666. Ask for Manny!